The Envirocycle Mini Composteamaker comes with a small capacity of 17 gallons or 2.27 cubic feet. No assembly is needed for this model, so you can start using it immediately. 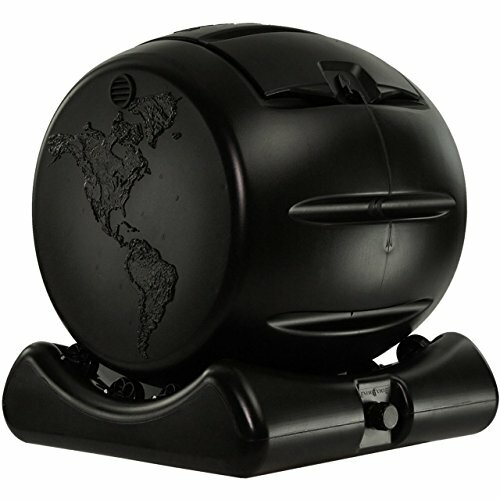 This spinning composter is made with the highest grade of recycled plastic materials. Because of its compact design, this composter is perfect for those who have limited space but want the advantages of composting. 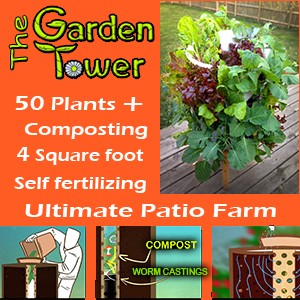 The base is sturdy and functional as it collects compost tea when you rotate the drum to turn the compost for best results. ​As compared to the Lifetime Tumbler, the Mini Composteamaker is smaller in size and capacity. However, its sleek design and many great features, like its base, can’t be beat. The mini version is slightly cheaper than the Lifetime Tumbler. Moreover, it requires no assembly, unlike its competitor. The Mini is more expensive than the Redmon Green Culture. However, the Mini Composter looks more durable. It also has better features including a sturdy base which the Green Culture lacks. The Redmon composter fashions a rugged look while the Envirocycle has a sophisticated look which will blend well in any environment, but it has a smaller capacity. Unlike the Redmon, the Mini requires no assembly. Compact features - Despite its small size, it is packed with features that are only seen on Envirocycle's brand. The base collects compost tea while the barrel can be turned to hasten the decomposition process. It has a good sized door that can be opened to promote better aeration and humidity moderation. 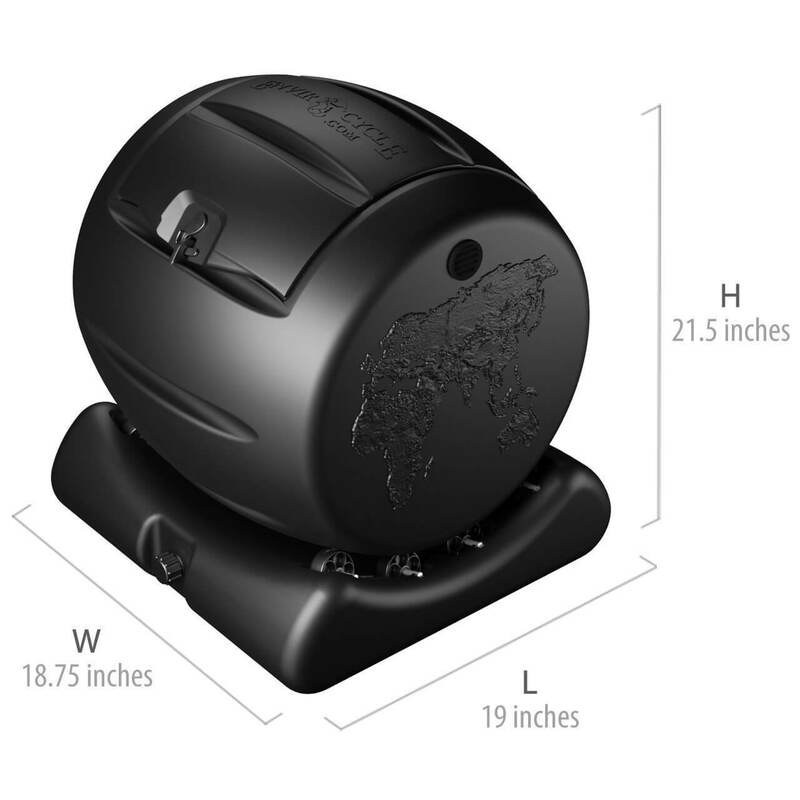 The rollers are specially designed on top of the base for better balance and simple rotation. Durable - This composter is made with durable plastic materials that are thick enough to withstand any wind or harsh weather. The materials are tested to be BPA-free and are from high quality materials to ensure better endurance for a long time. The hinged door fits tightly on the drum which assures long lasting durability. The product's base is designed to add stability to the drum. Attractive design - The product is cylindrical in shape and fits perfectly on its base. Its shiny black color adds sophistication to the entire design. More importantly, because of its small, attractive size it can be displayed on the patios or porches without taking up much space. Place it in a corner, and it can easily blend well to its environment. Ease of operation - There is no assembly required since the Mini comes pre-assembled. Turning the drum is easy. Simply place your fingers into the grooves and turn it three full rotations every three days. Removing the compost is also simple. First, secure the door latch and roll the barrel off the base. Then, you unhinge the door and unload it directly onto the soil where you need it. Alternatively, you can pour the material into a wheel barrow or trash bag if you want to spread the compost by hand. If you want to create potting soil, you can just scoop a small amount of it and add it into the mix. Bin is too small - A small number of customers have concerns over its very small size. This tumbler may be too small for those with big families. If you want a larger capacity, you can try the larger model, which has a 35-gallon capacity.If you need a composter with an even larger capacity than the Envirocycle models, you should consider other brands, such as the Algreen Products Soil Saver which holds 12.6 cubic feet of compost. Difficult to unlatch - There is a small number of customers who had issues regarding the unlatch feature of the product. This could be a factory defect or it could be due to the plastic hook used. This is a new design that replaced the old metal hook design.There were only a few customers with this complaint, but if you are concerned about the latch issue, consider other brands that offer better latch security like the Lifetime 60058 Compost tumbler. Rain soaks into the base - Quite a few customers have problems regarding their composteamaker base which can collect rainwater. This can happen if you place the composter outside with nothing to protect it from rain. It’s okay if a little water gets into the base, but if you want to be sure no water to gets in, you can place the composter under an overhang or place a cover over it. Is The Envirocycle Mini Right For Me? ​Then this might be the perfect composting bin for you. Because of to its small size, the Mini Composteamaker is the perfect choice for those who live in apartments or have limited space in their gardens or yards. If you want a neat and attractive composter, this product is would be a good option for you. Given its many features, its price is quite reasonable. This composter is highly recommended as it offers the collection of compost tea, a potent liquid fertilizer, in addition to compost. Check Out The Envirocycle Mini Composting Bin NOW!